This chapter presents an analysis of the unprecedented use of electronic voting by expatriates during the French 2012 legislative elections, when they elected their own representatives (referred to here as ‘deputies'), to the National Assembly in Paris for the first time, in 11 newly created overseas constituencies. The study is presented within the broader perspective of electronic voting in France more generally, and in the historical context of extra-territorial voting by French expatriates. The authors discuss the main issues and controversies that arose during the 2012 elections, and in a final section analyse the results. The authors conclude by drawing attention to recent developments in electronic voting in France since the 2012 elections, which suggest that although there was much criticism expressed by experts of electronic voting as to the security and transparency of the system used, the official discourse that acclaimed the experience as a success, appears to have convinced its target audience. Until its introduction for the election of eleven deputies for newly created overseas constituencies for expatriate citizens in the legislative elections of 2012, electronic voting had barely been used in France. Debates and pilot schemes had previously focused on the use of ‘electronic ballot boxes’ (sometimes known as ‘voting machines’ or machines à voter in French), located in the polling stations. These derived their legal existence from a law passed in 1969 by the Minister of the Interior, Raymond Marcellin, allowing the introduction of mechanical voting machines in order to reduce electoral fraud. These machines had failed to deliver any improvements and had fallen into disuse, but the legislation was modified in 2003 to allow for the use of electronic ballot boxes, following on from developments in technology and the increasing use of electronic voting in other countries (“Machines à voter,” 2003). This legal modification took account of three test schemes conducted during the presidential elections of 2002, which were run in parallel to the traditional voting method, in Mérignac (Gironde), Vandœuvre-Les-Nancy (Lorraine) and in the 18th district (arrondissement) of Paris. Vandœuvre-Les-Nancy repeated the exercise for the legislative elections the same year. In September 2003, the association ‘Forum for Internet Rights’ (FDI), founded with public funding, made recommendations to the then Minister for the Interior responsible for elections, Nicolas Sarkozy, regarding the future of electronic voting in France and the optimal conditions for its successful implementation (“Recommandations du Forum des droits sur l’Internet,” 2003). This report recommended that for all political elections, electronic voting should only take place using electronic ballot boxes located in polling stations, but that electronic voting from a distance (from private PCs) should be allowed for expatriate citizens voting in the elections for the Conseil Supérieur des Français de l’Etranger (CSFE), which in turn elected 12 members of the Senate (see below for more details). Debate then began to polarise between supporters and opponents of electronic voting. One of the leading voices of the opposition camp was a newly created association called ‘Recul démocratique’ (now called ‘Ordinateurs de vote’), which organised a petition in 2007 - a presidential election year - against the use of electronic ballot boxes, obtaining 85,000 signatures (now 107,161), on the grounds that they represented a risk to democracy (“Pétition pour le maintien du vote papier,” 2007). 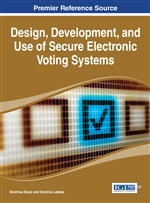 In 2008, a book highlighted in detail all the potential technical problems, notably bugs, system failures, undetectable fraud, hacking, and the exclusion of citizen control over the ballot boxes (Perline & Noisette, 2008). Political parties started to take positions, with those on the Left and the ecologists leading the opposition, and the Right-wing UMP led by Nicolas Sarkozy being in favour. The Centre-Right mayor of Issy-Les-Moulineaux, André Santini, was another key supporter, who argued that electronic voting was the best and most progressive way of fighting fraud, saving time, and eliminating errors (“Vote électronique,” 2009). He controversially used compulsory electronic voting in his municipality in the presidential and legislative elections of 2007, causing much public debate, and his detractors accused him of being in the pocket of the manufacturers of the electronic voting equipment. It was reported that 29.8% of the polling stations presented anomalies in the vote count in Issy-Les-Moulineaux, compared to an average of 5.3% for traditional voting, and discrepancies in other municipalities using electronic voting were also highlighted (Nymette, 2011). The formal response of the state to the issues raised came from the Constitutional Council, which published press statements in March and April 2007 confirming the legality and security of electronic ballot boxes, based on the 1969 law, but also acknowledging that long queues had built up in polling stations where they were in use (Conseil Constitutionnel, 2007a). In its final report on the elections in May, it reported the easing of this problem in the second round, and it made suggestions for increasing the number of electronic ballot boxes in future (Conseil Constitutionnel 2007b). It also discussed the reasons for the widespread opposition to this voting method, which it described as ‘more psychological than technical’, concluding that the ‘dematerialisation’ of the act of voting had dispossessed citizens of a traditional ritual, causing a sense of loss for which no amount of technical reassurance would be able to compensate.